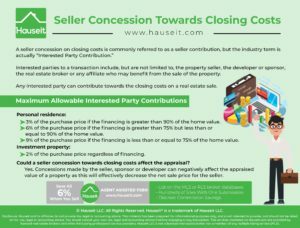 What does a Seller Concession Towards Closing Costs entail? Can the broker commission be used to “buy down” the buyer’s mortgage interest rate? A seller concession on closing costs is commonly referred to as a seller contribution, but the industry term is actually “Interested Party Contribution.” Interested parties to a transaction include, but are not limited to, the property seller, the developer or sponsor, the real estate broker or any affiliate who may benefit from the sale of the property. Any interested party can contribute towards the closing costs on a real estate sale. Many buyers already know that an Interested Party Contribution such as a buyer agent rebate can be an effective way to reduce one’s closing costs. But most buyers and brokers do not know that it can also be structured to reduce a buyer’s monthly mortgage payment! An Interested Party Contribution can be allocated towards origination points to improve the buyer’s mortgage interest rate. Please see below for an illustrative example. As you can see, with a creative buyer’s agent by your side, you can either reduce your closing costs upfront or lower your monthly mortgage payment over many years through a buyer broker commission rebate or other Interested Party Contribution. Just remember, it’s better to work with an experienced, full service real estate broker who doesn’t openly discount. There’s no point in getting a rebate if everyone knows about it upfront! 3% of the purchase price if the financing is greater than 90% of the home value. 6% of the purchase price if the financing is greater than 75% but less than or equal to 90% of the home value. 9% of the purchase price if the financing is less than or equal to 75% of the home value. 2% of the purchase price regardless of financing. 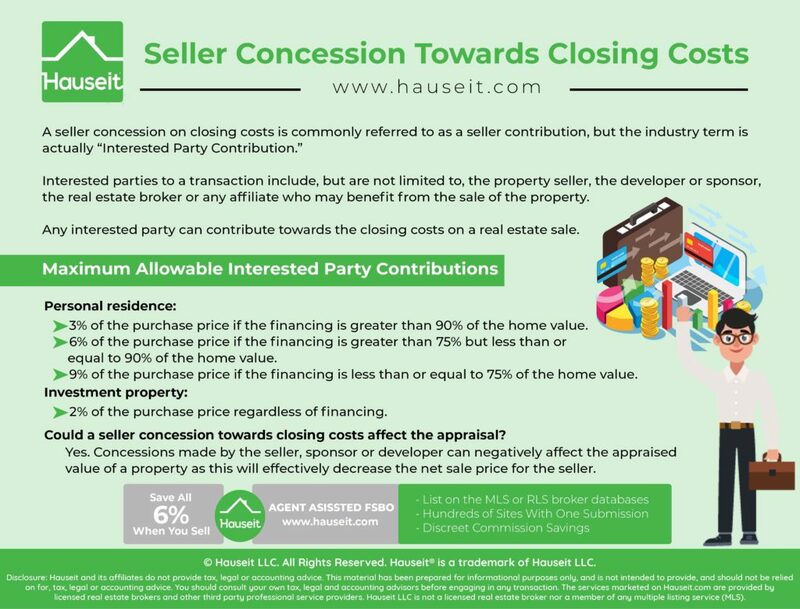 Could a seller concession towards closings costs affect the appraisal? Yes. Concessions made by the seller, sponsor or developer can negatively affect the appraised value of a property as this will effectively decrease the net sale price for the seller. 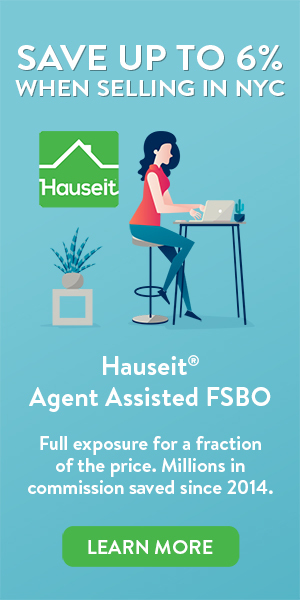 This may have consequences for the buyer in being able to get the maximum amount of bank financing and may even trigger the buyer’s mortgage contingency clause. Fortunately, if the concession is made by the buyer’s real estate broker it would be unusual to see any affect on the appraised value of the property, assuming that the real estate broker commission is within norms for the area. Because standard broker commissions are already factored into the appraisal, the seller is not considered by the appraiser to be making a concession to get the deal done.